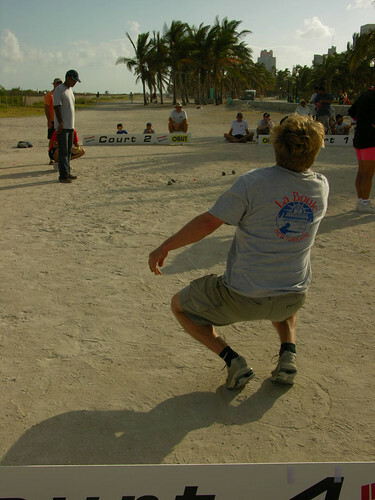 PÉTANQUE DESCENDS FROM one of the oldest games in human history, the archetype of which involves throwing or rolling an object as close as possible to a marker. Pétanque belongs to a family of ball games that developed in the Mediterranean, today called boules in French and bacci in Italian. In 1907 or 1910 depending on whom one chooses to believe, Jules LeNoir altered an older game, called le Jeu Provençale, thus inventing what eventually evolved into the modern sport of Pétanque. In the Jeu Provençale, players first draw a circle on the ground, then throw a small wooden ball — called a bouchon or cochonnet or but — out between 12 and 20 meters. Players take turns either pointing or shooting. Pointers try to place their boules as close as possible to the bouchon; to do so, they take one step from the circle, in any direction, and — perched on one leg — roll or throw the ball into the air toward the bouchon. Shooters try to knock the opponent’s balls away from the bouchon; to do so, they run three steps from the circle and, upon the third step — while in the air — throw their boule at the target boule, before the next foot (the fourth step) touches the ground. I am not making this up. The Jeu Provençale is actually a lovely and venerable sport, still played by tens of thousands, primarily in the South of France. The average game takes three to four hours to complete. The most important competitions are the French national championships, usually in June, and the Provençale, which takes place in the Parc Borély in Marseille, in August. Jules LeNoir was an excellent Jeu Provençale player until an accident left him crippled from the waist down. Although confined to a wheel chair, he began challenging players to a new betting game, involving pointing and shooting at a bouchon by players standing with their feet (or wheels) placed in the circle. 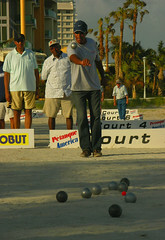 The word — Pétanque — is simply short for pieds (feet) tanqués (“securely fastened,” or “nailed down,” in local dialect). Jules LeNoir invented Pétanque in La Ciotat, then a thriving shipbuilding city and port found between Marseille and Toulon. Today, the shipbuilding industry is in ruins, and the French Communist Party recently lost their first municipal election in many decades. But there are two more or less professionalized bouledromes (Pétanque courts) in the city: Boulomanes and the exquisite Bouledrome Jules LeNoir. In the summer, these courts host tournaments nearly every day. Although there are many specific provisions for special situations, the basic rules of Pétanque are quite simple. One draws a circle, or “round,” between 35and 50 centimeters, from which the bouchon is thrown out 6-10 meters. Players then point or shoot with both feet fixed inside the circle. The surface might be sand or hard concrete; it might be full of rocks and sticks, or smooth clay and sand. The best players like more “technical” surfaces, courts that have lots of treacherous features. Great pointers are able not only to roll their boules on smooth surfaces with just the right “weight.” They also have to be able to throw the ball high into the air, landing with precision on a “safe” spot selected to get the boule to the bouchon. Great pointers are also able to spin their boules, from left-to-right or right-to-left, in order to avoid other boules or surface obstacles. Great shooters are able to hit balls at 6 or 11 meters, consistently, with equal ease. The best shot is called a “carreau”: the shooter throws the ball through the air, with lots of backspin; when it hits, the shooter’s ball stays right where the target boule was, spinning into place. A “carreau” effectively gives the shooting team an extra boule, since the ball that was shot now has the point. The next best shot is called a “palais,” where the shooter’s boule knocks the opponent’s boule away, while remaining relatively close to the bouchon, at least enough to count as the point. At the elite level, many games are decided by carreaux and palais, the team making the most win. That said, good pointing is a necessary condition for winning big matches, while good shooting is, at best, merely a sufficient one. Games are won by the first player or team to reach 13 points. Singles are one-on-one games played with three boules per player. Doubles and triples involve six boules per team. Games are divided into what the French call mènes, what I will call “rounds” or “innings” or “frames.” Points are tallied at the end of each round, that is, after all of the boules have been played by both teams. The team that has the boule closest to the bouchon gets one point, plus a point for every other boule that lies closer to the bouchon than the other teams nearest boule. Thus, in doubles or triples, a team could score six points, if each of their boules is closer to the bouchon than the other’s team’s best boule. The game is structured by another simple rule: a team has to play until it “wins the point,” that is, until one of its boules is closer to the bouchon than the other team’s best boule. Although Pétanque has few rules, it is strategically quite rich. If your opponent has the point on the ground, your team has to decide whether to point or to shoot. The decision is based on myriad factors: how many boules each team has left in their arsenals; how likely it is that one can win the point, given the lay of the land and the boules that have already been played; which player, with what kinds of skill, have boules left; and so on. If you shoot every ball and make a palais each time, you will score six points. But shooting balls consistently is one of the most difficult things to do in any sport I know, and missing a ball gives the other team a big advantage. Games typically last between 45 minutes and two hours. 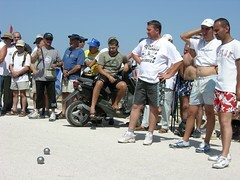 Pétanque is a popular spectator sport. At its best, Pétanque is both serious competition — often for money — and social theater. The game is full of big personalities, flamboyant egos, and weirdos. One has to be mentally tough to play at the elite level; most players, even gifted players, lack this toughness. Outside of the elite championships, there’s always trash talking, cheating, and showing-off to, and bantering with, the crowd. Even in relatively polite games, there is an important language, not always verbal, that mixes respect and aggression towards one’s partner and opponents. Great games never end, but are rather reconstructed and debated over pastis, a complex liqueur made of anis and a dozen other spices. The Pastis bar is literally built into a good bouledrome setting in the South. The best clubs have true connoisseur spectators, whose involvement in a game or tournament is total: they watch attentively; they actively debate the pointing and shooting decisions of the teams; they banter with the players; and they sometimes even intervene in disputes taking place on the courts. The best spectators in the Marseille area congregate at the Boule Florian (Sortie Saint Loup, near the OM Vélodrome, between Marseille Centre and the town of Aubagne). If you’re in Pétanque Land — especially Provence, the Maritime Alps, Corsica, the Aveyron, the Auvergne, and the Languedoc-Roussillon — you might consider taking in a tournament. Or ask in a local bar (not the fancy ones!) for the location of the best bouledrome. Look for a crowd — crowds do not watch mediocre players. Competitions are announced in local newspapers. The most important tournaments are the French singles, doubles, and triples championships (June and July), the Mondial la Marseillaise (July), and the Mondial de Millau (August). I play the Marseillaise and Millau, and go to the French championships every year. 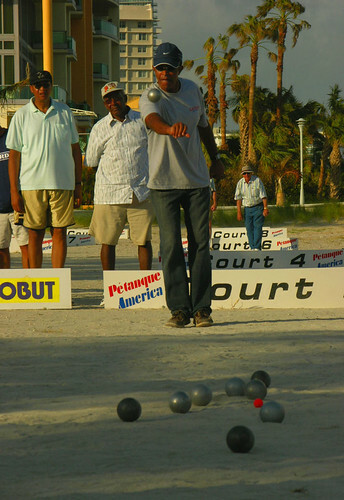 The World Championships, a kind of international Pétanque Olympics, take place annually, usually in late-September, and involve more than 60 national teams. I represented the USA at the Worlds in 2003, 2005, and 2006, and will do so again in 2007. I post annual photo-illustrated reports on competitive pétanque around the world on the website of my home club — La Boule New Yorkaise. For an English translation of the complete rules of Pétanque, and for information on clubs in the U.S..
© 2005 - 2011 La Boule New Yorkaise. All rights reserved.